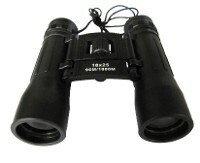 Folding prismatic binoculars. Rubber coated for comfort in your hands. Center focus with individual eye adjustments. Compact so you can always take it with you. 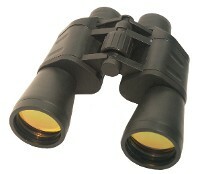 Folding prismatic binoculars. Rubber coated for comfort in your hands. Ruby red coated lens for night vision. Center focus with individual eye adjustments. Compact so you can always take it with you. 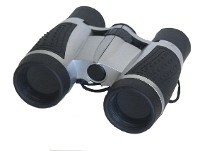 Sturdy construction clad in soft rubber 4 x 30 folding binocular. Blue coated lens. Center focus. Folds up for convenient carrying. Comes with case with belt loop. Neck strap. Glass lens. 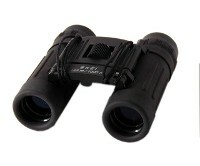 10 Power binocular with 50mm lens. Ruby Coated. Pouch included. Monocular is calibrated up to 200 yards so you can determine how far your golf ball is from the pin. Only takes a few seconds to use. Rubber coated. Ground and polished glass lens. Wrist strap. Comes with vinyl carrying case with belt loop. Brings objects 30 times closer. Sliding focus. 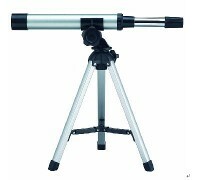 Ideal for land or sky viewing with bright, clear images. Table tripod extends to 15 inches and folds for storage. Scope can be removed from tripod for hand holding. 30mm objective lens.